Designed specifically for spas and hot tubs (this particular heater is not one that you’d ever want to try and heat a large 10,000 gallon+ pool with), this electric heater will definitely transformedy our overall experience – and the amount of time you spend in your hot tub or spa – almost overnight! As I’m sure you’re probably aware, there are so many different pool heater options on the market today. It’s enough to make anyone’s head spin. Trying to find a picture-perfect heater (especially a rather compact and “underpowered” electric heater like this one) can be a real nightmare. 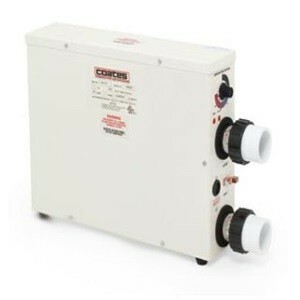 You will be extremely happy with my decision to go with the Coates 12411ST electric swimming pool heater! It’s almost impossible to explain how such a small and compact unit is going to be able to heat your entire spa or hot tub when you first set eyes on this particular system, but thanks to its almost 38,000 BTU capabilities it’s more than up to the task. Taking advantage of some pretty smart electrical engineering (and a built in pressure flow system to optimize heat transfer), this little gem measures just 17.5 x 4.5 x 14.5” – but packs one heck of a punch! I like a lot of the specifications of this particular unit, but the ridiculously inexpensive price tag (we’re talking just north of $500) is probably number one on the list – followed closely by its energy efficiency rating that keeps operating costs just as low. Another gem that you will appreciate is the fact that it offers a variable water exchange rate measuring between 15 gallons per minute and 80 gallons per minute, which allows you to dictate just how quickly (or how steadily) your pool is heated. The only thing that I wasn’t exactly crazy about with this particular pool heater is that it runs only off of 240v power supplies. This required me to run an extra line underground out to the pool maintenance shed. For those that have already accessible hookups this won’t be that big of a deal. I kept trying to figure out how such a relatively compact system was able to produce the kind of efficiency that most people hope to take advantage of. That’s when I realized that it takes advantage of specifically designed electric heaters and a stainless steel system to boost the heat transfer process through the roof – helping to elevate efficiency across the board. When you combine this with the fact that you are in control of just how many gallons per minute are pushed through the system (and, in turn, how many “passes” water needs to go through to be exchanged in the system to reach optimum temperature), and you’re talking about an efficiency rating that is unlike anything else out there. Again, thanks in large part to that stainless steel tank system and the 240v 37,543 BTU power, this specific spa heater is going to be able to deliver all of the heating power you could ever hope to take advantage of with zero headache or hassle along the way. Additional features include its ability to monitor pressure through a transfer case, its ability to take advantage of a close differential thermostat (an internal one, at that), and the use of smart heat transfer technology. Combines these give you the pool experience you’ve been dreaming of without killing your electricity bill at the same time. At right around $500 or so (depending entirely upon where you purchase this product from), to say that there is some real value for the money is a big understatement. You would be hard-pressed to find any electric heater out there at this price point that comes close to offering the same kind of benefits that this one does. Get your hands on one just as quickly as you can – you won’t regret it!